The rise of the dark fluid is here! Use tubes, stoppers, containers and intersections to control and contain it! 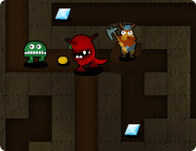 This epic idea packed sequel to the original full of new levels and tougher challenges. Clear ice by running and jumping. Once enough ice is removed, capture a flag to proceed to the next level. Arroy keys to move, Spacebar to jump. A fun math/puzzle based game, fill all the pots with water to complete each level. Use telescopes to put a ball in the hole.